Disintegrating completely after a pretty rough run of things during World War Hulk, it’s been a little over three years of inactivity for Marvel’s ragtag group of mercenaries, the Heroes for Hire. Appropriately enough, since it was a company-wide summer crossover event that led to their split, it was Daredevil’s recent mega-storyline, Shadowland, that brought them back together again, albeit with a significantly altered (and noticeably more powerful) roster. 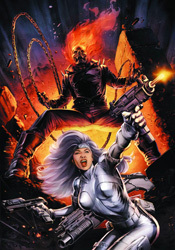 Missing are the lesser-known creations that had formerly populated the squad; now their slots are filled by heavy hitters like Elektra, Ghost Rider, the Falcon and Silver Sable. Frequent collaborators Dan Abnett and Andy Lanning, known for their work with Nova and the similarly galactic-faring mini-crossovers Annihilation: Conquest and Realm of Kings, quickly prove they can work just as well inside Earth’s gravitational pull. Their rendition of the team is straight laced and professional, in contrast with the more free wheeling, seat-of-their-pants demeanor of the previous squad. It’s also a revolving door of sorts, with faces from different corners of the Marvel Universe popping in for a guest spot, then disappearing a few panels later. The only real constant is Misty Knight, last woman standing when the previous group met its end, who’s pulling the strings from a mysterious control room deep within an undisclosed location. The prospect of an ever-shifting cast with a connection to the publisher’s upper class opens up a lot of doors for this series, and cuts away some of its previous limitations as a small cluster of C-Grade supporting characters. Granted, I don’t expect any of the Avengers to show up on Misty’s payroll any time soon, but the obvious increase in available firepower is just what the new series needed to declare its own identity. Abnett and Lanning have retooled Heroes from a fringe mercenary series into a genuine international operation – locked, loaded and already hip deep in the action. Brad Walker and Andrew Hennessy, who teamed with Abnett and Lanning for the majority of their run on Guardians of the Galaxy, are back at the duo’s side for Heroes For Hire’s return. They’re a great fit for the shadowy, action-with-flair style intended by the story, with an explosive knack for the big moments and an uncanny ability to add depth to the small ones. Walker and Hennessy’s characters are thick and substantial, holding true to their larger-than-life stature, with each guest spot treated with the kind of familiarity usually reserved for the regulars. Walker and Hennessy know that, in order for a team-up book to really find a degree of success, it’s crucial to spotlight and showcase each character’s individuality, and if this early showing is any indication they’re most definitely up for the task. The pair handles everything from demonic flames to duck-and-cover firefights with the same degree of panache. Keep this team together as long as you can, Marvel, because this is a formula that works. Abnett and Lanning are ready, willing and able to deliver nonstop action with reckless twists and turns, and with Walker and Hennessy at the wheel I’m confident we won’t end up in a fiery wreck at the end of the road. The new Heroes For Hire is an exploding barrel of a good time, loaded with just enough star power to actually mean something. Buy it.